Can you prevent stains and spots on your autographed baseballs? Staining that is not the result of handling or storage. 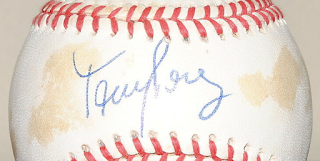 I was recently looking through my autographed baseballs; mostly obtained in-person in the 1990s and early 2000s. They are all Rawlings Official American League, National League or Major League Baseballs. I am well are of proper storage conditions and they have been stored in archival cubes in a cool, dry closet since they day they were signed. 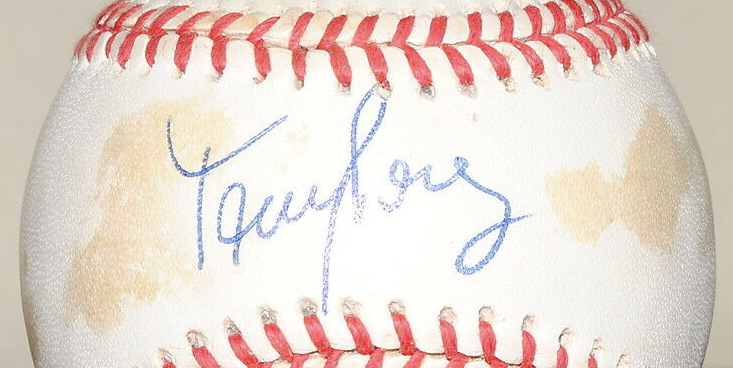 However, in a shocking number of cases, the baseballs have dark toning and stains - not typical even toning. On some, portions of the ballpoint signature have almost evaporated. This is not like UV fading, but portions of the signature are significantly lighter than other parts. Yet, some balls stored in the same closet are still snow white. I suspect this is the result of chemical reactions of oils and/or the chemicals used to process the leather. Perhaps depending on the manufacturing lot, the way it was processed made it more prone to the staining. It is certainly not environmental or from handling. In my view, recently signed baseballs are like investing in a ticking time bomb. Even under the best conditions, they can fade or stain to the point of undesirability. There isn't a thing you can do to prevent it. Now, I would not purchase a signed baseball unless it was at least 20 years old at this point. I think if you get to a certain age and the ball is still clean looking, it likely stable and will remain free of atypical spots or toning.